First published in 1989, this ground-breaking book sought to determine whether contemporary Russia had the capacity to change and if, in so doing, it could alter the complex web of East-West relations from a zero-sum struggle to a state of peaceful competition and mutual security. In order to answer this question, the author compares advances and setbacks in arms control and security affairs with co-operation on less politically salient issues such as environmental degradation. He finds that in the nearly seventy years preceding Mikhail Gorbachev’s rise to power, the Kremlin relied on several basic approaches to foreign relations. These policies isolated the Soviet Union from those nations whose co-operation it needed to cope with the escalating interdependencies of the time. 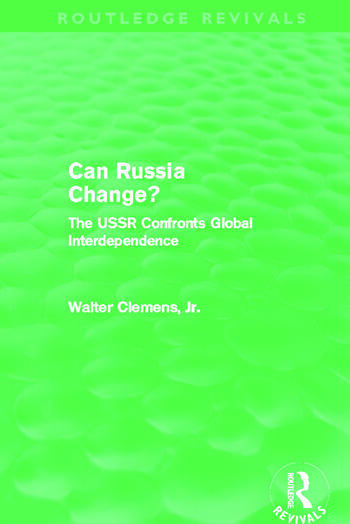 Gorbachev, Clemens argues, was the first Soviet leader to recognise both the problems and potential benefits of global interdependence and to explore the possibilities for co-operation between East and West to advance mutual security. Can Russia Change? is unique in its comparative approach and historical perspective, and this reissue will prove invaluable to all those interested in the history of Soviet security and foreign policy, as well as US-Soviet relations.